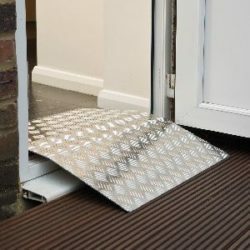 A common problem when providing wheelchair access to a uPVC door is getting over the often quite high threshold. The usual solution of a sheet aluminium bridge has to be removed to allow the door to close which is hard for a lone wheelchair user. The interior plywood ramp has been installed such that it is just low enough to allow the door to close. 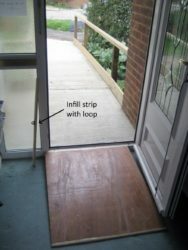 The light weight infill strip closes the gap between ramp and the weather strip of the threshold. 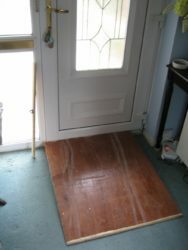 It is light enough so that can be fitted and removed with a standard pick-up stick (engaging with the flexible loop) by a lone wheelchair user. Internal ramp fixed in place, with infill strip removed to allow door to close. 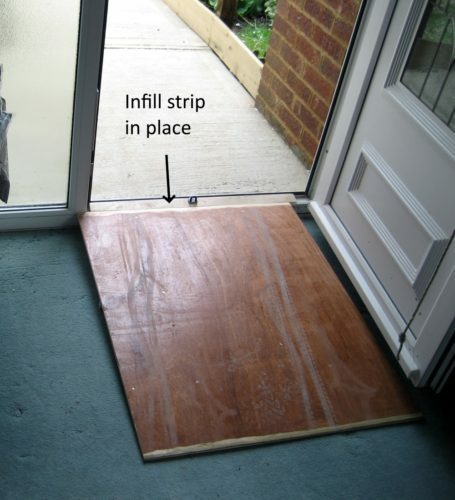 Infill strip in place to allow wheelchair to pass over threshold. Door closed, with internal ramp still in place. The client can now leave their house on their own, increasing their independence.